Dr. Waters spent some time in the office and often saw the chiropractor at his high school, where many of the sports teams were treated. He decided then that chiropractic would be the profession he wanted to pursue. He attended Parker Chiropractic College in Dallas, where he took the time to pursue an education outside of the classroom by attending different conferences and seminars. 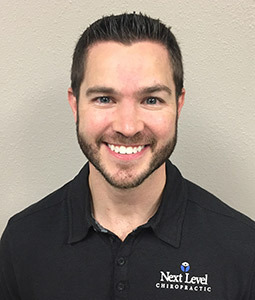 After graduating in 2008, he immediately opened his own practice, Rockwall Pro Health Chiropractic. When the offer came to merge his practice with Dr. Buffington, Dr. Waters jumped at the change. It’s one of the best offices in the entire United States. I take it as a great compliment that Dr. Buffington gave me the opportunity to come and work in the practice he had built. Outside of the office, Dr. Waters spends much of his time traveling to chiropractic events and learning opportunities. His brother and sister both live in the area, with his brother working as the head basketball coach at Rockwall Heath High School. Dr. Waters follows sports closely at the high school, college and professional levels. Next Level Chiropractic is a member of the Rockwall Area Chamber of Commerce. Dr. Waters is a member of the Texas Chiropractic Association and The Chiropractic Syndicate founded by Dr. Buffington.